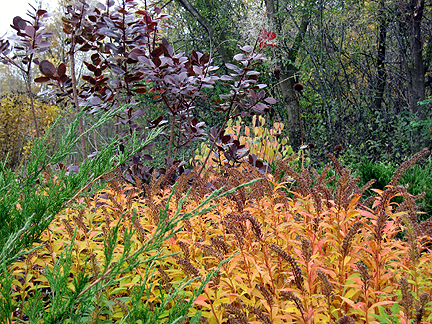 For more fall color, check out Dave's Fall Color Project 2009. 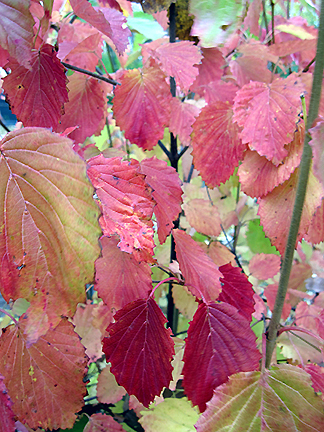 Now, I ask you, isn't the fothergilla foliage above drop-dead gorgeously stunning?! And its spring flowers are pretty awesome as well. 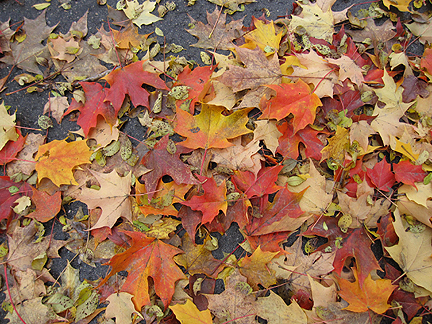 Maple leaves from my neighbor's tree fell artistically onto the street. 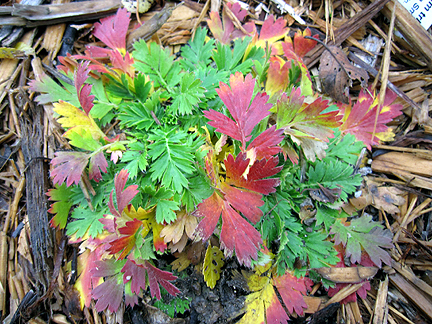 I didn't realize that the foliage of prairie smoke turns red. Noogie! Look at my lovely Diablo ninebark! I got it several years ago as a $3.33 gallon shrub at a big box store, and now it's taller than me--at least 6 feet. 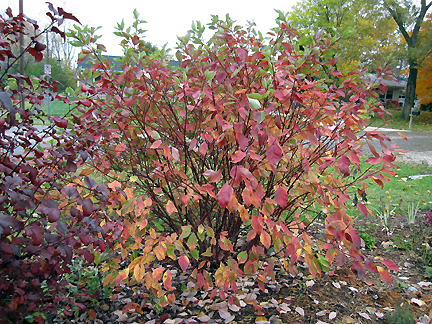 I love its dark color all year, and especially its redder shade in fall. It also gets great big white blooms in spring. I've never once been able to capture its true beauty on film, though. This is my red-twig dogwood. It's huge now, and doing very well. I bought it as a bit of a reject at a year-end sale a long while ago. Noogie! Here is the viburnum outside my bedroom window. If I were the kind of person who wasn't too lazy to go into the basement to check through a huge envelope full of plant tags, and if I were also the kind of person who actually made notes on plant tags as to the location of planting, I'd be able to tell you what kind this is. I have seven viburnums and they're all wonderful, but I'll be plum-doggied to know which is which. I'm not wild about gooseneck loostrife, but you can't beat their fall color. It's really intense IRL. I got them from a coworker who has since passed away, so though they spread aggressively, and I thin them out each spring, I can never get rid of them altogether, as they remind me of Marlene. In case you couldn't see the purple smokebush in the background of the gooseneck loosestrife in the previous photo, here it is close-up. It struggled for years and finally came into its own this spring. Aren't the leaf veins awesome? My sweet native chokeberry, purchased this spring. 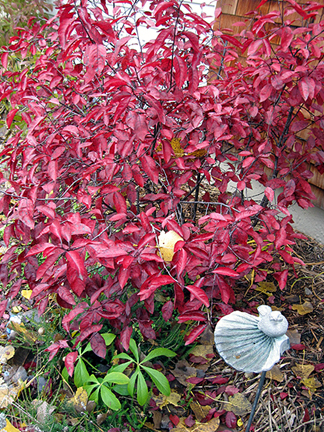 I love this shrub and its wonderful orange fall color. A fall feeling in my front yard (photo is taken with my back against a front corner of my house, facing the street and a neighbor's house across the street). 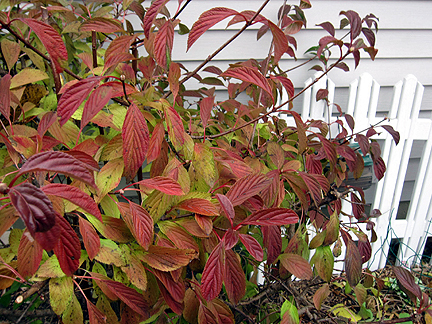 I transplanted this spirea this fall and it looks none the worse for wear. And look at the tiny obedient plants in the background. They are small (and much later blooming than my huge 4-feet plant out front) because this was a shadier location before I cut down all that buckthorn. 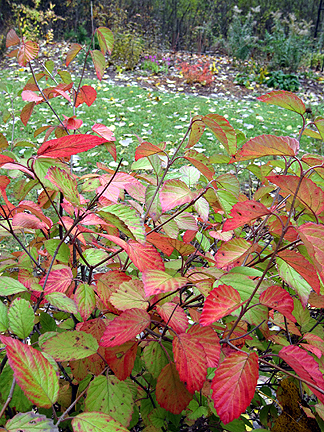 Aw, isn't the variegated red-twig dogwood sweet? I had no idea how wonderful its fall color is. (I had two of these in the entirely wrong locations (too shady) and moved them this spring (one all the way to TN! ;-).) It's grown more this season than it has the previous two years I've had it! Barberry is on my city's invasives plant list. It's a big no-no. But, um, well, I planted it as one of the very first things when I moved to my current house, as a detriment to kids who were cutting through my property instead of using the park path not ten feet away. I have pulled out two other barberries, but, dagnabbit, this one is too big to mess with and it's staying. I think the removal of 1,476 buckthorns (approx.) equates with the keeping of two barberries! 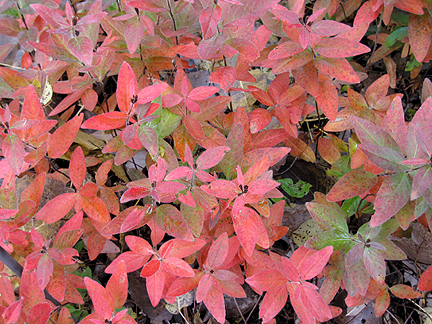 Plus, look at its great fall color! 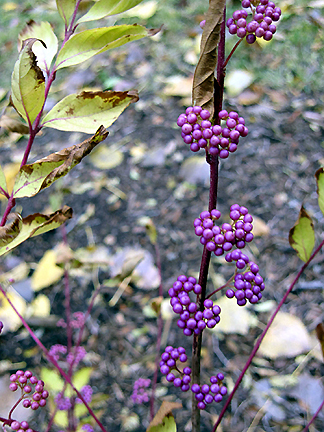 Beautyberry is fairly nondescript all season, but its vibrant purple berries are worth the wait. Here's the viburnum at the back of my house. 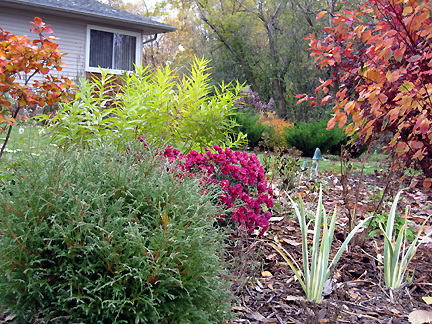 The native tall coreopsis turned a gorgeous dark red this fall. They're about 8 feet tall, too! Here's my viburnum along the fence. I'm a little "so over" evening primrose, but I do enjoy its "hello-I'm-here!" red fall leaves. 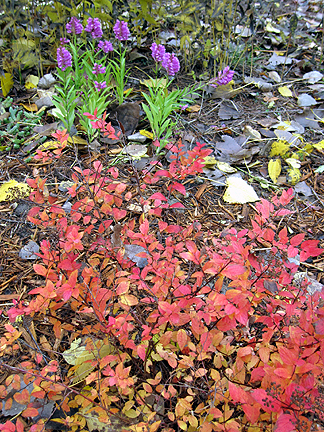 The burning bush was magnificent this year, but it rained before I thought to take a photo. Another viburnum next to it, in this area next to my neighbor's driveway. Here is that same viburnum close-up. Wheee! Here's the viburnum at the other end of the front of my house. (You thought I was kidding when I said I had a lot of viburnums?!) This one gets pink flowers in spring. I like how the leaves of all the viburnums vary, not just by variety, but by location (sunnier vs. shadier). The purple sand cherry was planted in honor of my dad (who died in 1997 and would have been 72 on Saturday), in a convoluted kind of way. Let's just say it's a Prunus, as are plums, and one of my dad's favorite snacks were Zwetschenknödel (plum dumplings made with a special kind of plum; I know Bek will know what I'm talking about!). Also say hi to the hellebore! 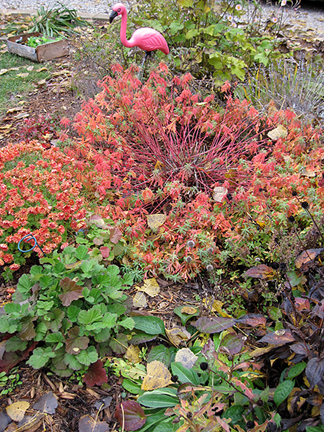 OK, the sedum is always that dark shade of red and the coral bells are always that green, but I love the combo and the cottonwood leaf makes it fall-y. I love the seeds of iron weed. I'm saving a lot for the seed swap! I saw a comment of yours on someone's follow-up comments while checking my email before going downstairs to start cleaning out my pantry. I thought, "i haven't been to her blog lately." I'm glad I came to see all your lovely fall colors. I don't have many bushes, but did plant some viburnums along the back fence at my garden across the street. I need to go out and see if the leaves are changing colors. I did say hi to your hellebore. I just planted some this spring, after finding seeing some at my sister's new (to her) house. They didn't do much over the summer, but now are sending up new stems, which I read that the flowers will come from. I am so ready for spring! I have the week off of work, and tomorrow should be the warmest day (in the lower 60s) to get some garden clean up done. In the meantime, I better get myself downstairs to clean my pantry. I should have edited my comment before sending it. Well, you should get my meaning, even though I messed up here and there. I love all your fall color, Monica. Your garden is looking alive with all the atumnal changes. I especially love all your 'Noogie' bargains! I love a good bargain, and a free-bie is even better! 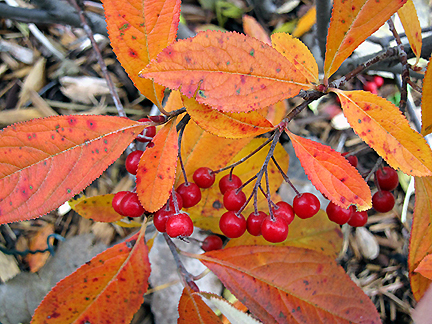 The Fothergilla, the Chokeberry, the Diablo Ninebark, all the Viburnums--everything is gorgeous! AWESOME fall color! I like your style of gardening with mostly shrubs. Me too-I'm a big shrub and tree person believe it or not. I don't have seven types of viburnums but I'm getting there. I haven't met one I didn't like. 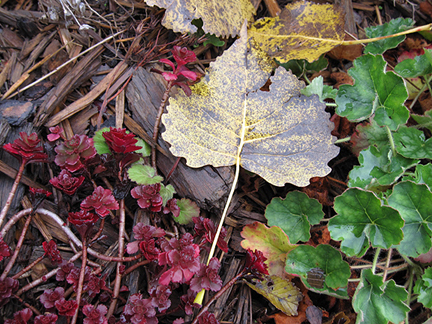 Dave at the Home Garden is doing a fall color blogger wrap up if you'd like to participate. This fall color is outstanding. Way better than mine; which will be coming on Wednesday. Wow, Monica, your garden is a riot of color right now! You're making me want to get out Hubby's chainsaw and chop down those overgrown yews of mine and plant some REAL shrubs. 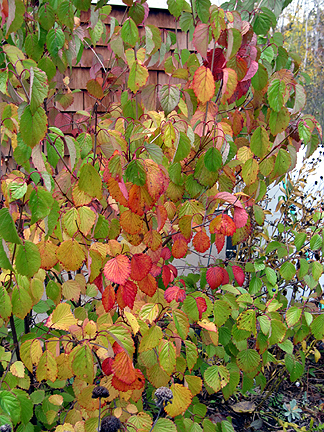 I love the fothergilla and the nine-bark...but frankly, I love all of these! 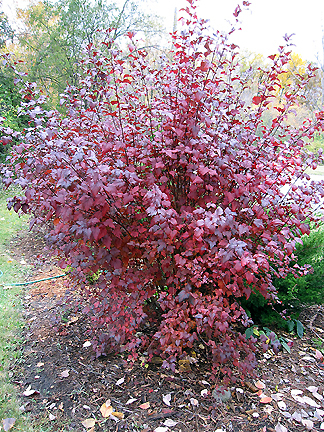 First, I learn burning bush is considered invasive in Indiana and now barberry in Michigan. 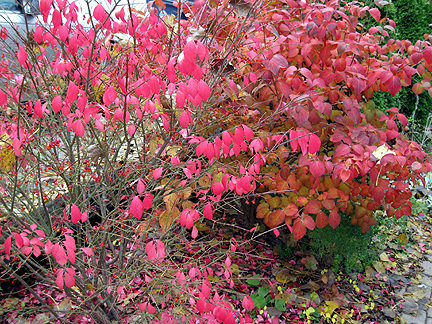 I'm not about to give up my burning bush, though--it's the one bright spot of color in my front yard right now. And I think you've earned the right to keep that barberry after ridding the city of all that buckthorn! I remember having some kind of delicious plum dessert in Germany--Pflaumkuchen, if I recall. Daaaang girl! You have lots of terrific fall color, thanks for sharing! Your garden looks fantastic, Monica! 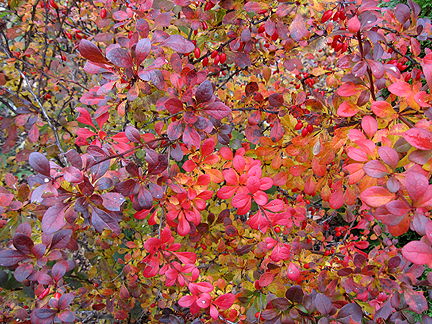 I do love shrubs, and the variety of autumn colours is wonderful. I've been thinking of getting a viburnum - I'll have to see what's around here as I'm inspired now! 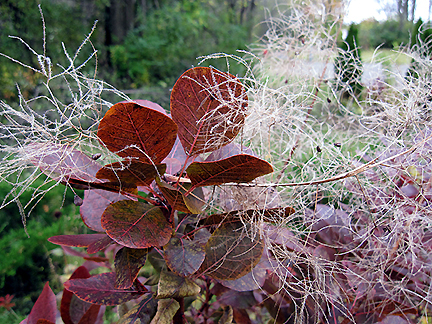 I've always loved the purple smoke bush too, but never had one - yet! Wow, you've got some stunning fall colors there. I like your approach with shrubs, especially when they can give you all that! Lovely. Shrubs are one thing I don't have a lot of. Love the variegated dogwood with the white berries. That is outstanding. The ironweed is pretty, I never see it for sale. Fall color was disappointing here this year. My maples came thru with some gold and the pagoda dogwoods have a dark wine almost black leaf. Everything else went from green to brown to ground. What beautiful fall color! 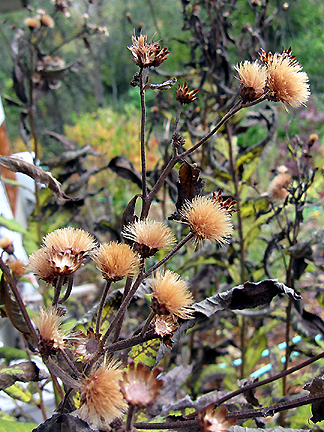 I love the looks of the ironweed too, somewhere (I think on my sister's blog) it was noted to be related to joe pye weed. My smoke tree is struggling awful, I've got to move the poor thing. Your garden is a blaze of color Monica. I am amazed at the native coreopsis. I don't think I have seen this before. Oh yes, I "need" seed of iron weed. What can I trade you for some?? Monica, this post was a long time coming, but oh so worth the wait! 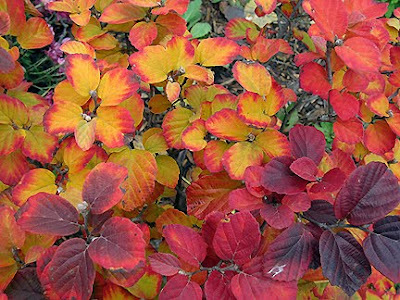 What gorgeous foliage all over your gardens. I am envious. 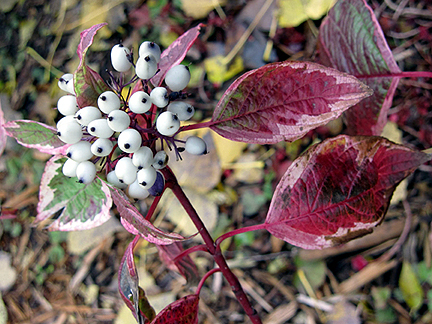 :) I love the red twig dogwood and the white berries. I have been waiting to see the flamingo. :) What a perfect location you have found for her. The colors in your garden are indeed fantabulous! 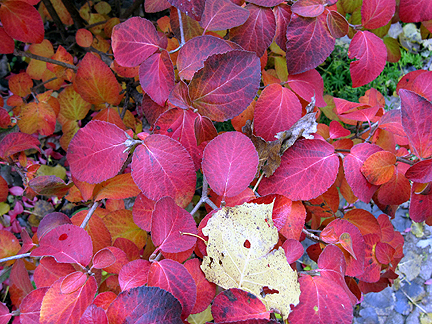 I haven't seen a Fothergilla that beautifully colored before. 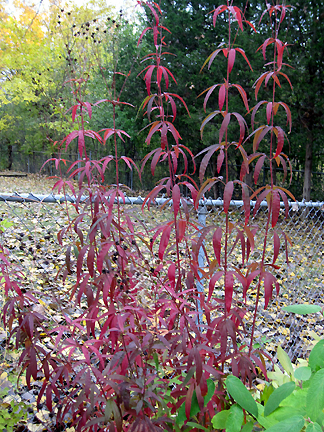 I didn't know that Gooseneck Loosestrife had fall color and I haven't seen a coreopsis that turned such a beautiful red before either. What a wonderful fall show! Wow, that's truly great Fall colour. Mom especially liked the native tall Coreopsis. 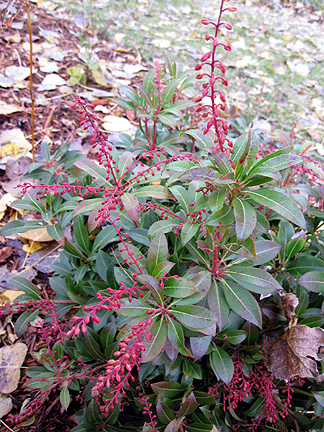 She also said she has two Pieris japonica too and they both have their buds ready for Spring. They keep them all through Winter to bloom early next year. Such dear little plants. Woah, what glorious colours Monica!!! The glory of Autumn in full swing with the colors of jewels..one last week or so and the leaves will be on the ground.A lovely walk with your Autumn garden Monica! 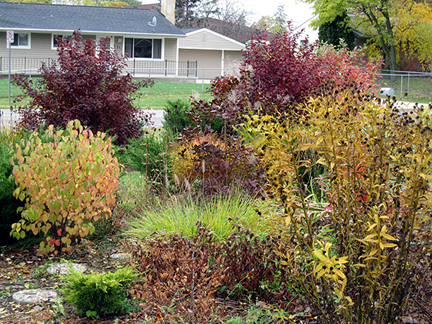 Wow, lots of great shrubs giving you lots of great fall color Monica! Fantabulous is the perfect word for it. I know I'm not 'supposed' to like gooseneck loosestrife, but I do. I've always liked it. 'Course, since I tend to stay away from stuff that tends to be invasive, I've never grown it. I have a feeling not much of anything would be invasive here competing with the maple roots though. Anyway, I like the stuff - I like the blooms and the fall foliage. Photos of wonderful leaves. I hope they are lifting your spirits. I'll have to come back to study them and learn better what these plants are. The red veins st in purple are impressive. And I haven't seen Beautyberries before. Really do hope autumn blows fresh enthusiasm into your soul. They are all so yummy! All show stealers in your garden. When I read the first sentence I asked myself: "self, how many shrubs could she possibly have?" Then I started scrolling, scrolling and kept scrolling through the pictures. You weren't exaggerating. 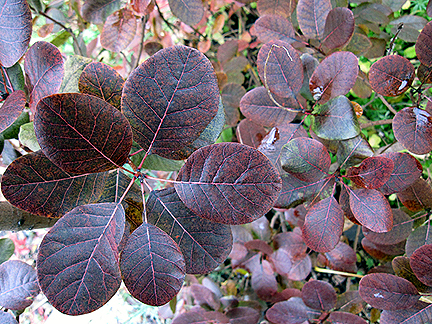 My faves are the fothergilla, purple smokebush and the beautyberry. Awesome tour of your fall foliage. Thanks for joining in! I'm a little late getting to it but I'll add you in today to the project. I love the chokeberry! It does look very fall-y there. I love the Viburnums. I just realized how much they change in fall. Monica, What a wonderful post you created... are you able to enjoy your yard enough?? It's just gorgeous over there, what with the variety of foliage color, shape, texture and all the plants, etc. What about a camp-out in the back yard? ;-) Happy Fall! and Enjoy your day! Wunderbar buntes Herbstlaub, liebe Monica. Einige "Bekannte" habe ich auch gesehen bei Dir. Ach so was ich noch sagen wollte: Meine pelzigen Freunde werden nie und nirgends ausgesperrt. Egal was ich gerade tue ;-). The colors of fall thrill me as much as the daffodils in spring -- lovely pictures! Boy, you've been saving a lot up while you cleared out that bed. It looks great, with lots of room for lots more plants. The new xeric bed is shaping up nicely. I love the form of Yuccas & Rattlesnake Master, but I don't grow them because they are too painful. Oops! The previous comment went with the next post. You have fabulous fall color. I love Fothergillas, but they don't love my garden. (Sigh.) But I'm most gobsmacked (if I may use that term), by your Coreopsis. The blooms have nothing on the fall color! Your garden is lovely! Have you ever thought about adding garden decors like wind chimes and garden spinner? They add a bit of pizazz in any garden space.